-	Unlocking new potential for microalgae in aquafeed -	Single cell protein: Is this space technology ready for aquaculture? -	Aquaculture: Why the need for measuring, monitoring, and data logging? WELCOME Fishing is one of the oldest human activities and has always been associated with rivers and lakes and, more primordially, with the oceans. But as aquaculture evolves at a dizzying rate, it seems that many are turning their gaze inland with the rise of Recirculating Aquaculture Systems (RAS). FISH FARMING TECHNOLOGY Everyone agrees that life is more complicated nowadays. In the past, universities had Departments of Zoology. Now there are Departments of Animal… Husbandry, Services, Care and Control, Health, Veterinary Martin O’Farrell Services, Welfare and Behaviour. The Fish Management Systems, UK welfare of farmed animals throughout their lives and, particularly, at the time of slaughter is now very high on the agendas of producers and consumers. The welfare of farmed fish, throughout their lives and at the time of slaughter is a relatively new consideration. We have been involved in aquaculture, one way or another, for about four decades. Our collective experience relates to rainbow trout, Arctic char and Atlantic salmon culture, humane slaughter and environmental impact. We have seen significant technological change and we have seen no change! At the end of the second decade of the twentyfirst century, modern seawater RAS systems are producing high value kingfish while freshwater flow through earthen ponds are still in use in rainbow trout production! Our focus now is on the humane slaughter of finfish produced in freshwater or seawater. ‘Humane’ is a word that requires definition. According to the Oxford Dictionary, the definition of ‘humane’ is ‘showing compassion or benevolence’. In the context of global fin-fish aquaculture, it is probable that only a very small percentage of farmed fish are treated humanely at the time of harvest. In the context of European finfish aquaculture, guidelines on the humane slaughter of farmed salmon and rainbow trout have been in existence for perhaps one decade. Many modern European fin-fish farmers have moved away from thermal shock (ice slurry) with or without CO2 (now banned in some countries) to dry electrical stunning, in-water electrical stunning and percussion stunning. Our expertise relates to in-water, in-line electrical stunning of farmed fish in freshwater or seawater where fish are stunned within one second of entry into a ramped DC field. We have encountered fin-fish farmers using batch in-water electric stunning systems which deploy AC fields. We have been reliably informed that a period of about seven minutes is required to kill every fish in the batch Robin McKimm and that, unfortunately, a significant Fish Management Systems, UK percentage of fish exhibit carcass damage (blood spotting etc). Does in-water exposure to an AC electric field for up to seven minutes sound ‘humane’? Does dying from asphyxia in air over an even longer period sound ‘humane’? Of course, dying of asphyxia in air is also the fate of countless fish captured by commercial fishing vessels throughout the world. And this issue is now, finally, being looked at by some EU member states/agencies. There is a desire among fin-fish farmers to improve the harvest methods they deploy. However, many require customised solutions related to available space on harvest vessels/existing fish pump availability/electric power requirements etc. It is rarely a case of ‘out with the old and in with the new’ and more frequently a case of ‘in with the new provided it is compatible with some or all of the old’! The requirement for the new slaughter system to be ‘humane’ is measured against the old and less ‘humane’ slaughter system in terms of efficiency (manpower requirement/slaughter rate) and processing requirements (time to rigor mortis/carcass quality targets). When harvest/slaughter objectives are ranked, should they be weighted as part of the ranking process. Is it desirable to operate a ‘more’ humane system with a reduced slaughter rate or a ‘less’ humane system a with longer time to the onset of rigor mortis? We have presented at various aquaculture conferences and have used a provocative slide which shows pictures of fish, fowl and other farmed animals. The caption reads: ‘if you had to, which one would you rather kill’? The fish is the obvious choice. Those who continue to deploy less than humane harvest methods must know that their farmed fish suffer in silence at the end of their lives. This is no longer acceptable in civilised society. special thanks to Mario Steal and John Cooksy who have always made these events worthwhile to attend. If only they could organise a way to reduce my 17-hour travel! The trade show brought many new technology systems to the industry and in the coming months we will showcase many of them. The highlight of the tradeshow was the purchase of Calitri Technology by the American giant Pentair Aquatic Eco-Systems who, in the past purchased, American company Aquatic and more recently Icelandic Dowds Eco-Systems company Vaki, further demonstrating the global expansion of aquaculture with rising demand for a more sustainable protein source. Our next trip across the pond is to Honolulu, Hawaii February 9 – 12th 2020 and the following WAS event in Singapore, from June 2 – 5th 2020, with a little trip to my homeland, Ireland, in September 2020. NUTRITION & HEALTH We have challenges for fish due to the The aquaculture industry embraces effects of extrusion on the thermolabile so many disciplines and is reliant on nature of many enzymes but I am a vast array of technologies in the assured that much is being done to biosciences to advances in technology develop more robust and stable enzymes and engineering. It is obvious that such as xylanases and hemicellulases, large trade shows and industrial mixed function proteases and specific events will form an important gateway phytases that can greatly enhance the for the meeting of stakeholders such efficacy of plant based ingredients of as academics, commercial agents, Professor Simon Davies low fishmeal formulations. technologists and those in the feed Nutrition Editor, International Aquafeed Everywhere I turned, there was much and health sectors particularly. These mention of the gut integrity and meetings can be transformative and functionality of various products and their positive interaction greatly contribute to joint ventures and lucrative trade of the immune system and effects on modulation and stability. agreements. Such was my experience last month in a most dynamic setting at Excellent graphics and brochures were available to support claims and a number of digital platforms and video illustrations the VIV Asia 2019 event I held in Bangkok, Thailand. It was an excellent opportunity to meet with the industry face on and meet that would be enviable in the classroom. Algae, microbial biomass, yeasts and novel plant protein up with so many past friends and to make new acquaintances. concentrates were all on display as well as a range of companies It was a very large venue and after a long 13-hour flight worth promoting vaccine technology for animals including fish and it all to see the many stands and exhibits from many countries also various chemotherapeutic agents against infection and making it really an international venue. parasites of all kinds. I cannot do justice to the many companies attending but I also had the pleasure of visiting my colleagues and friends at suffice to say that this reflected the wider animal production the prestigious Royal University of King Mongkut in Bangkok. industry with a strong emphasis on pig, poultry production as Dr Noratat Prachom hosted my visit and I was able to meet well as many examples of products for aquaculture. It was a with the Dean of The Faculty of Science and Technology and goldmine for IAF considering our new incorporation of fish staff to see developments and their investments in aquaculture farming technology as well as our long-standing expertise research focusing on tilapia, shrimp and integrative technology. in reporting developments in feeds and nutrition of fish and They have a strong nutritional theme and much talent for marine crustaceans. science and aquatic biosciences in many disciplines. The aquafeed area has many new opportunities to advance and We discussed collaborations and how I may help in future to I was delighted by the increased awareness that feed enzymes project their excellent initiatives internationally. I must thank all could play a major role to this effect. Many companies have the organisers and my Perendale colleagues for the professional excellent products at hand, and I was impressed by the display input and detail as well of course the VIV group from the of products at VIV Asia available for mono-gastric animal Netherlands. production that seem to work so well for poultry and pigs. 40 Expert Topic - Meagre Exploring the biological and socioeconomic potential of new/emerging candidate fish species for expansion of the European aquaculture industry (DIVERSIFY). 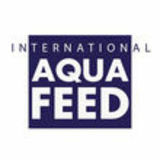 DIVERSIFY have kindly teamed up with International Aquafeed magazine to provide us with the results of the research carried out on the six species of the project. Over the next siz issues we will bring you the finding for; meagre, greater amberjack, halibut, pikeperch, grey mullet and wreckfish. FEATURES 22	Insect meal 24	Unlocking new potential for microalgae in aquafeed 28	Single cell protein: Is this space technology ready for aquaculture? know their products to be tried and tested with regards to withstanding Orkney marine conditions.” The new salmon farm is set to benefit non-aquaculture businesses too. Scottish Sea Farms’ Regional Production Manager for Orkney, Richard Darbyshire explains, “Not only will we be working with local suppliers to the sector, but our salmon pens will be constructed by Gael Force Fusion on the remote island of Sanday, generating spend on everything from hauliers, ferry travel and accommodation at the nearby Kettletoft Hotel, to generators, welfare units and sundries for as much as three months or more.” In addition to generating revenue for Scottish businesses and service providers, the new farm will create six new full-time roles and lead to further job creation across the supply chain. Gael Force Group Founder and Managing Director Stewart Graham says, “As part of a planned increase of 10 new employees in Lochaber, we have already advertised six newly-created fabricator roles as a direct result of the barge being built at Gael Force Boatbuilding in Corpach, and we are also increasing our workforce with multiple new roles at our pen-building facility, Gael Force Fusion in Oban.” These latest contract awards come on the back of a year in which Scottish Sea Farms spent a record £113m across 676 local suppliers – £33m of which was investment in its new RAS smolt hatchery at Barcaldine – equating to 75 percent of total supplier spend in 2018, with plans to invest a further £25m in capital infrastructure projects over the next 12 months. n election of World Aquaculture Society Officers, Directors, and Bylaws changes for the year 2019-2020 was held during December 19, 2018 to February 3rd, 2019. However, due to electronic voting irregularities, the Board of Directors decided to void the result and ask the membership to re-vote after fixing the Internet voting system. The WAS Election Committee is now asking the membership to cast your vote again. Please, note that this is the same ballot approved previously by the Board of Directors. It contains the same candidates for President-Elect, Treasurer, and Directors, as well as the same proposals to Bylaws changes. One change to the voting system is that member ID can no longer be used as passwords. Members that had not changed their passwords were recently sent new passwords. If you had previously changed your password, that password is still valid and should be used. To prevent multiple voting, only ballots with correct member IDs will be counted. When ballots are received at the Home Office the member ID will be checked against a list of IDs (no member names) in order to ensure an anonymous vote and to eliminate repeat voting. Note that proxy vote is not allowed. Please use thefollowing link to vote: www.was.org/Ballot Users can alternatively email judya@was.org if they require a pdf version or you can print from the link above and return by post to ‘WAS Elections Committee 20182019, WAS Home Office, PO Box 397, Sorrento LA 707780397 (USA)’ Ballots must be received in the Home Office by May 29, 2019 either by online vote or by mail, fax, or email. Ballots received after this date will not be counted. Maximize capacity, conditioning, and control. WENGERâ&#x20AC;&#x2122;S AQUAFLEX XT HIGH CAPACITY EXTRUDER When maximum volume matters, the Wenger AQUAFLEX XT High Capacity Aquafeed Extruder is the choice, processing up to 12,000 kg/hour. Equipped with either our High Shear Conditioner (HSC) or High Intensity Preconditioner (HIP), the AQUAFLEX XT is ideal for aquatic feeds as small as 0.5 mm. Precise control of finished product density delivers either high capacity floating or sinking feeds. Know more about the industry-changing designs and customized options of AQUAFLEX. Email us at info@wenger.com today. stable microbiota goes hand in hand with its resistance against pathogenic or environmental challenges. The application of new metagenomics techniques enables to show that it is possible to orientate shrimps gut microbiota with probiotics in order to help enhance their resistance against pathogens or sanitary challenges. The efficacy of probiotic bacteria Pediococcus acidilactici MA18/5M (BACTOCELL), the only probiotic authorised in the European Union for use in shrimp and fish, to help prevent the proliferation of vibrio in vivo was presented. In conclusion, shrimp microbial management should be a multifactorial approach, involving shrimp nutrition and management, as well as water and pond microbial management. Norway, Denmark, Scotland, Iceland, Canada, Australia, Turkey, and Spain. Their products include pontoons, pens, recirculation systems, feeding systems, feeding chambers, submarine lights, environmental sensors, feeding assistants with artificial intelligence, production and process control software, etc., all which contribute to the world aquaculture industry with new and attractive solutions. STRONG ENOUGH TO FACE EVERYTHING! ubject to approval by authorities, BioMar acquires the 50 percent remaining shares in the Chilean factory APSA. Ending 10 years of successful collaboration with AquaChile, this will immediately release important capacity for BioMar in Chile. Back in 2007, when BioMar acquired Provimi Aqua, the joint venture in the APSA factory was part of the package. Since then BioMar Chile has been producing feed to AquaChile and to various other customers from the JV. If approved by the authorities, BioMar Group will get access to a significant volume of flexible production capacity. Carlos Diaz CEO of the BioMar Group explained, “We are happy to announce this acquisition, which reinforces BioMar Group’s commitment to the Chilean market. With the transaction, BioMar Chile will achieve a better possibility to serve the broader customer base and plan for future upgrades and expansions of the facility. We experience an increasing demand for our high-end products and we need to take the next steps ensuring our ability to deliver during seasonal peaks”. The acquisition, representing a value of 17 million USD, takes place after AquaChile last summer was acquires by the new owners Agrosuper. “We have during the years experienced a fantastic cooperation with AquaChile, and we are happy that the new owners have facilitated a friendly and smooth negotiation to get the deal in place. I would personally like to thank the former owners for a collaboration that has helped us grow our position in the market, being the independent, agile feed supplier committed to an efficient and sustainable aquaculture”, stated Mr Diaz. Beyond this operation BioMar Chile continues the commercial relationship with Agrosuper and AquaChile. “Looking forward we expect to continue delivering feed to AquaChile. We are cooperating in a very positive way and we are determined to maintain a fruitful commercial relationship”, explained Mr Diaz. and identity, which so far have been very evident in food from agriculture. Now, Cermaq’s salmon from Norway will reach the customers with a clear Arctic identity. “The brand platform True Arctic Salmon is a foundation for our close cooperation with our customers to support their success in their communications and marketing. We focus on successful category growth for our customers, and believe this will be a useful tool for our customers. This is part of our strategy of being a leading customeroriented B2B company, “says Cermaq’s Global Sales and Marketing Director, Arild Åkre. The launch of True Arctic Salmon, which takes place at the Boston Seafood Expo, includes a separate web site True Arctic Salmon. The launch continues at the Brussels Expo in May. “The Arctic has its own identity, with magnificent nature, tough conditions, and cold and pure water. Here we produce salmon with Arctic effect that has specific product qualities. These are some of the elements in the origin of True Arctic Salmon, and what conscious consumers care about, “says Arild Aakre. BOA compactor PTN’s patented pre-compacting technology – the BOA compactor, a unique alternative for double pelleting or expanding. A double-walled mixing chamber in which steam and liquids are introduced and the mixture is compacted using a hydraulically operated compacting chamber. Your global technology process supplier for the aqua feed industry ANDRITZ is one of the world’s leading suppliers of techno­ logies, systems, and services relating to advanced indus­ trial equipment for the aqua feed industry. With an in-depth knowledge of each key process, we can supply a compatible and homogeneous solution from raw material intake to finished feed bagging. authorised the inclusion of insect meal in aquaculture feed. Innovafeed, which has established itself as a leader in insect meal production for aquaculture, explains why they view 2019 as a turning point and how they plan to make insect meal a competitive alternative. Maye Walraven, their Head of Business Development, comments, “There’s a strong interest in insect meal from scientists, investors, feed formulators to fish farmers. First movers to adopt insect meal view it as an opportunity to create value rather than a threat - there’s a strong messaging for end-consumers on aquaculture’s benefits to using a natural and sustainable ingredient”. volumes, ensure the highest product quality, and create value for our partners.” To meet the first of these objectives, InnovaFeed has announced the construction of its next factory that will significantly scale-up its production by the last quarter of 2019 and targets an annual production capacity of 50,000 tonnes of insect meal by 2025. Convinced of the sector’s strong potential and InnovaFeed’s executional capabilities, Creadev and Temasek (two large French and Singaporean investment funds) have chosen to back InnovaFeed in this scale-up effort. InnovaFeed’s next production unit will be located right next to a starch facility in Nesle, North of France, which is owned by Tereos, a leader in sugar, alcohol, and starch production. By partnering with Tereos, InnovaFeed secures quality 100 percent plant-based agricultural by-products as basic feed for breeding its insects, without generating any additional pressure on natural resources. “As a matter of fact, the quality and stability of the feed is a key factor to ensure the quality of the insect meal,” explains Guillaume Gras, co-founder of InnovaFeed and Head of Product Development. Furthermore, by integrating their industrial processes, such as sharing the utilities that have already been installed on the industrial platform, the two companies are contributing to minimising the impact on climate change. researchers are continually looking for alternative feed solutions, and one of the most promising of these is microalgae. Microalgae have been used as part of the live feeds chain in aquaculture hatcheries for some time, but there is now a drive to exploit these organisms in formulated feeds. This technology is still in its early days and, at present, the use of microalgae as bulk feed ingredients is still some way off, due to costs and product availability limitations. As a result, the current focus is on the use of algal products as functional ingredients to enhance traditional feeds during sensitive periods of the production cycle, or in specific situations arising from farming practices. Microalgae have great potential as a source of functional ingredients, offering supplementary benefits alongside basic nutrition, filling a notable gap in the aquafeed sector. small amounts of feed containing low levels of lactoferrin-enriched algae and evaluating these to determine the most effective dose to include in feeds, as well as the best formulation. While gains in overall growth and a reduction in losses are key benefits, the value and overall health of farmed fish can also be a function of their skeletal development and wellbeing. Accordingly, the team has also looked closely at the effect of lactoferrin-expressing strains on bone development in fish, using zebrafish – which are frequently used in biomedical research, for example, to study cancer, diabetes and cardiovascular diseases – as the model species. The big advantage of zebrafish is their speed of development; meaningful results are available in days, rather than weeks, and can easily be transposed to other species. CCMAR is investigating the effect of the microalgae itself – with and without lactoferrin – rather than the diet, with promising results. In early experiments, larvae were exposed to water, ethanol and dimethyl sulfoxide (DMSO) extracts of the microalgae for three days and the increase in bone development of the operculum was evaluated. The DMSO and ethanolic extracts showed increased bone development ranging from 27-43 percent, indicating that, in the context of biomedicine and nutraceuticals, there are anabolic factors associated with the microalgae. Both native and engineered microalgae were investigated, with positive results obtained from even the wild-type biomass, while the transgenic biomass produced an enhanced positive benefit, suggesting that the observed effects are due to a combination of compounds and/or proteins. Further experiments have been performed by rearing zebrafish with rotifers fed on both the wild type and engineered algae for one month, and differences were observed in skeletal development. Lactoferrin is known to promote osteoblastic development in other models, and this was also noted in the zebrafish. Within 30 days, it was possible to make reliable gene expression analysis of the bone marker genes responsible for the differences between the two types of microalgae. With the engineered algae there was a clear increase in both the development and the quality of the skeleton, and the genes relating to the development of the osteoblast were also upregulated, producing more bone and additional cells. The University of Limerick (UL) is a rapidly growing, modern university. UL is a young, energetic and enterprising university with a proud record of innovation in education, and excellence in research and scholarship. We take great pride in attracting students who are seeking a supportive learning environment to help nurture and achieve their personal and professional dreams. UL is highly regarded for conducting leading-edge research in key areas such as biological sciences, information and communication technologies, materials and surface science, environment & bioengineering and humanities & social sciences. Limerick is in western Ireland, an ideal starting point to explore the Wild Atlantic Way. Shannon International airport is only 24km away with frequent bus connections. Limerick, with an urban and hinterland population of over 200,000, has something to oﬀer everybody thanks to its many cultural, historical, architectural, sporting, shopping and business activities. With almost 50 per cent of Limerick’s population under the age of 30, it is a vibrant, living, cosmopolitan city. SINGLE CELL PROTEIN Is this space technology ready for aquaculture? he concept of using single cell organisms (bacteria, yeast, fungus and algae) as a protein source was developed during the cold war for space travel. Today, UK’s Quorn Foods sells over US $250M of beef and chicken substitute, which utilises protein from fungus grown in large fermenters. But could Single Cell Protein (SCP) become an alternative protein for fishmeal? Creating an alternative for fishmeal has turned out to be quite a challenge. Vegetable protein is cost effective and scalable, but does not have the essential amino acid content, to match the quality of fishmeal. As early as twenty years ago, Norferm, a Statoil and DuPont Joint Venture, has produced high quality SCP for aquaculture. The company leveraged excess natural gas in the North Sea, as feedstock for methanotropic bacteria, that utilises methane as the energy and a carbon source in fermentation. The project was abandoned in 2006, due to high capital and operating cost, as well as lack of production worthiness – problems which still face recent attempts to revive the technology. Creating an alternative for fishmeal has turned out to be quite a challenge. Vegetable protein is cost effective and scalable, but does not have the essential amino acid content, to match the quality of fishmeal. As early as twenty years ago, Norferm, a Statoil and DuPont Joint Venture, has produced high quality SCP for aquaculture. A large number of algae start-ups, a decade ago, planned to leverage the sun and CO2 to produce a high-quality protein. However, open ponds proved to be susceptible to contamination, while closed systems had high operating costs. Today, there is a flurry of start-ups leveraging municipal waste to produce insect protein. While the product quality is good, it is way too early in the technology cycle to determine ultimate cost and ease of scalability. Based in the Netherlands, Rabobank is an international financial service provider, operating on the basis of cooperative principles. Yet, with all these issues, Rabobank’s Senior Seafood Analyst, Gorjan Nikolik, predicts that “novel feed ingredients will boost marketability of farmed fish and can reduce the cost of production.” White Dog Labs (WDL) is working very hard to prove Gorjan Nikolik right! WDL was established in 2012 in Delaware, USA, on the foundation of biotechnology and bioprocess development. It has invented a proprietary process, ProtocolB™, for the isolation, selection and cultivation of microbiome-derived Clostridia. Clostridia is a long known, but less understood, class of bacteria, with promising implications for nutrition and health. The company has also developed MixoFerm™, a fermentation technology that consumes sugar and CO2, thus increasing the cost effectiveness of bioproducts ranging from food and feed, to biofuels and chemicals. WDL’s first product is ProTyton™ - a non-GMO Single Cell Protein ingredient. It is produced from corn and it exhibits upwards of 80wt percent crude protein and over 40wt percent essential amino acids. Figure one compares ProTyton to other protein ingredients. The product is highly digestible and performs well in multiple aquaculture diets. Due to its high crude protein and essential amino acids, ProTyton allows incorporation of lower cost ingredients to reduce total feed costs, as summarised in figure two. ProTyton is produced by anaerobic fermentation, and it is well known that anaerobic SCP can also contain immuno-stimulating secondary metabolites and nucleotides. Moreover, ProTyton SCP also contains low levels of butyrate, a short chain fatty acid commonly used as a terrestrial feed additive, to support gut health and reduce antibiotic use. ProTyton was thus expected to provide health benefits, beyond its nutritional value, and has indeed demonstrated an ability to counter Early Mortality Syndrome (EMS) in shrimp. As can be seen in figure three, 20 percent inclusion of ProTyton has onethird the mortality rate of a commercial diet that is formulated especially for shrimp health. While all the tests reported above were carried out by the Centre for Aquaculture Technologies Canada (CATC), several major aquafeed companies have qualified the product and WDL has already secured off-take for its first plant. The company is currently producing ProTyton for qualification by major feed companies in its pilot facility in Delaware, using the 18,000-litre fermenter shown in figure four. ProTyton fermentation, similar to that of ethanol, is a simple anaerobic process, thus allowing straightforward use of ethanol plants for ProTyton production. WDL has reached an agreement to locate its first plant inside the MRE ethanol plant in Sutherland, Nebraska. The plant will produce 3000 tons/year of ProTyton, starting in the fourth quarter of 2019. For every one kilogram of ProTyton, the plant will produce three kilogrammes of MiruTyton – a Butyrate rich co-product. OPTIMAL SECURITY ASSURED WITH OUR CERTIFIED ATEX20 CRYLOC ROTARY SIFTER. It’s hard to imagine the grain and bulk processing industry without the use of the Cryloc rotary sifters. Due to the Atex 20 certifcation, the Cryloc is specifically designed to be added above your Hammermill. Before grinding, the fines are sifted out so that only the raw materials are processed through the Hammermill. Thus creating an optimal and safe grinding process. by B. Serdar Yildirim, Akuamaks, Turkey When it comes to working with offshore or freshwater (river/pond/dam) cage systems, it’s crucial to analyse and log the levels of oxygen and temperature in order to have a strong emergency plan, a good feed conversion ratio (FCR), risk free transport and a healthy stock. The measurement when it’s performed manually may not be as efficient and correct for several reasons such as lack of staff, high workload, calibration defects, harsh weather conditions or cable length of the appliance. Measuring monitoring, and data logging •	Measures dissolved oxygen, temperature and saturation levels instantaneously •	In standard equipment, the user can set the alarm limits •	In “Barge + Cage Model”, instant measurement results are transferred to the tablet in Barge from the cages where it’s connected by Wi-Fi connection, allowing the staff to monitor the data immediately •	The results are transmitted to the central server over the Internet connection at intervals of five minutes from the tablet, which is monitored in Barge •	In cage facilities without barge, if the distance of the measured cages to the land is less than 400 meters and if there is an office with Internet connection on land, the same system can be used. There is a separate file for all systems in the central server. All measurement results can be viewed up-to-date as soon as they are received, as well as recorded. The records can only be accessed by authorised personnel by using a user name and a password. All data can be accessed via tablets, mobile phones and computers anywhere on the globe with Internet connection. The results can be displayed either graphically or as an Excel spread sheet, instantly or by selecting a specific time period. The module, easily assembled with only four bolts in the top of the cage, meets the needs of the battery in the waterproof IP 68 housing, which is supplied with the required solar panel. Mounting on module, the next generation optical technology probe has a cable length of 15-metres. It can be lowered from the side surface of the cage to the deep side, from the midpoint; it can provide access to the deepness of the level that fishes are fed. Thus, the dissolved oxygen, temperature and saturation measurements at the depth are transferred to instantaneous results. that are required for the galvanic probes. As with galvanic probes, there is no risk of calibration deviation due to membrane puncture and solution depletion, which means there is no false measurement risk. Optical probes are very durable and have no feed for frequent calibrations as is the case with galvanic probes. They have a technology that makes accurate measurements. Visual checks can be performed through the protective cover; the probes can be used safely and can be cleaned even by wiping with a finger. of low micron mesh drum filters), enhancing water clarity, gas transfer efficiency, sight of feed and appetite, whilst reducing gill irritation and risk of hydrogen sulphide poisoning from excess solids in the system Constant partial sterilisation of the system - Reducing detrimental bacterial colonies and pathogens, and various life stages of some parasites Fish stress reduction - Especially when in handling situations, which improves appetite upon recommencement of normal operations and enhances general health Reduced heterotrophic competition in the biofilter - Increasing its efficiency, whilst partially directly reducing ammonia and nitrite with the use of low levels of ozone Increased degassing of CO2 - Especially with the use of cascade type skimmers which combined the skimming process with degassing, and increased oxygen levels in the system as the ozone reverts to oxygen Despite these operational benefits, realised through the use of ozonated protein skimming, there are still RAS facilities that are being built without this technology. In my experience, this is mainly due to the lack of having in-house R&D capabilities (where working with and testing these technologies encourages advancement of the whole RAS design), as well as the increased capital expenditure of the project with their inclusion. However, once they are implemented in a facility, the savings and benefits on an operational side far out-weigh the initial expense. There are many new RAS facilities that cannot achieve a good water quality and clarity because of this and hence do not reach their production targets. water, transitioning it from a brown, muddy appearance to almost perfect clarity. This is being achieved by use of ozone micro-dosing through a cascade freshwater protein skimmer, automatically controlled with a redox probe measuring the ozone level at the highest point of saturation. The system is also fitted with degassing, UV sterilisation and a secondary redox probe as further treatment and safety features. The use of the ozone, protein skimming and UV with incoming water of such low quality, demonstrates the extent of the cleaning ability that this treatment process can have, even in freshwater. HardRIB The single most important factor for a boat is its seakeeping abilities. That is why we have put enormous effort into the design of the hull of the HardRIB. Full control even at high speed, low fuel consumption, near indestructibility and fantastic seakeeping ability is a benefit for all users. The various equipment options ensure that you can customize the boat for your use without compromising any of the above attributes. The hull is developed in collaboration with Ola Lilloe Olsen and tested in Stadt Towing tank. So, whether you are a fish farmer, a diver or simply a boat enthusiast, this is the right choice for you. FISH FARMING TECHNOLOGY The egg incubation room is supplied with top-up water filtered to one micron and the ambient air temperature is controlled to closely match the water temperature. The custom-built incubation trays are individually fed so that each of the eggs obtain a uniform amount of oxygen and new water, providing the best environment to produce healthy, robust fry. The 24 tanks in the on-growing system are equipped with full environmental and monitoring system control, including such features as photoperiod and temperature manipulation, as well as oxygen and ozone micro-dosing, low-level ozonated protein skimming, carbon dioxide monitoring and degassing, and full individual feeding control and pellet/faeces collection. The water is clear, with efficient macro and micro-particulate solids removal and constant partial sterilisation. The high degree of filtration is clear in the abundance of brown foam produced by the ozonated protein skimming and sludge from the drum filter effluent. The design features of this facility and the minimal operating costs evident by the low power consumption of the singular pumping point in the system, show what is possible to achieve in a truly modern and advanced RAS with a progressive design. If this efficient use of oxygen, ozone and power was to be utilised in large scale fish farm designs for new facilities, their operating costs would be kept to a minimum and RAS feasibility for post smolt salmon and other species would increase. Aquaculture Without Frontiers (AwF) is a Charitable Incorporated Organisation (CIO) that promotes and supports responsible and sustainable aquaculture and the alleviation of poverty by improving livelihoods in developing countries. 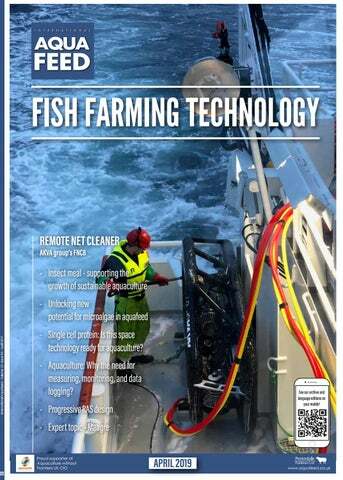 TECHNOLOGY SH Top aquaculture technology April This month we take a look at some more of the innovative technology present at AquaFarm in Italy, as well as the latest innovations that help make processes easier for those in the industry. segments of the EU market, aquaculture fish have a weaker image than wild fish. Parallel to technological improvement of production methods for the new species, expansion opportunities for the EU aquaculture sector have been identified. The combination of biological, technological and socioeconomic research activities developed in DIVERSIFY are expected to support the diversification of the EU aquaculture industry and help in expanding production, increasing aquaculture products and development of new markets. breeding programme(s), the majority required an increase in the number of families. Both genetic tools and protocols to control reproduction for breeding programs were developed. The muscle and liver transcriptome were determined and the first genetic linkage map for meagre was constructed using the ddRAD (double digest restriction-site associated DNA) methodology, which identified 731 markers organised in 27 linkage groups. The model mapping identified five quantitative trait loci (QTLs) on two linkage groups, which exhibited significant evidence of linkage at the genome level and multiple QTLs were related to differences in body weight and length. Protocols for the induction of tank spawning in paired crossing had a 76 percent efficacy of spawning pairs with male rotation and produced a total of 61 families (full and half-sib) that had >200,000 eggs with >80 percent fertilisation success. However, a decline in spawning success that was observed with repeated induced spawning with male rotation was a possible drawback that was highlighted. Protocols were also developed for in vitro fertilisation for planned crosses. Meagre sperm had a mean sperm density of 3.21·1010 ± 1.18 spermatozoa/mL, motility duration was 1:43± 0:18 min, mean percentage of initial motility of spermatozoa was 48.17 ± 2.80 percent and the mean initial spermatozoa velocity (VAP) was 90.69 ± 5.76 µm/s. Different sperm storage methods and cryopreservation techniques were modified to provide protocols for meagre sperm. The optimal period for stripping eggs was 38-39 hours after the application of gonadotropin releasing hormone agonist (GnRHa) and a ratio of 150,000 motile spermatozoa to egg was recommended. The results of DIVERSIFY provided the technology required to implement industrial breeding programs and scientific advances in the reproductive control of marine fish in general, as well as sperm characterisation and genetic resources for meagre and related species. Despite the interest of meagre for aquaculture diversification in the last decade, there is a lack of information on nutrition during larval development. Dietary HUFA levels of three percent improved larval growth and lipid absorption and deposition. Besides, among fish fed three percent HUFA, increases in vitamin E and vitamin C improved significantly body weight, as well as lipid and HUFA contents in the larvae. Thus, weaning diets for meagre must be optimised increasing HUFA levels up to three percent and vitamins E and C >1500 and 1800 mg kg-1, respectively, in order to spare these essential fatty acids from oxidation. A 0.4 percent dietary HUFA is not enough to cover the essential fatty acid (EFA) requirements of meagre larvae. It is also important to supplement meagre weaning diets with 2.4 mg/kg vitamin K, since the absence of this vitamin reduced markedly larval survival. Meagre seemed to be very sensitive to hypervitaminosis D and only mildly sensitive to hypervitaminosis A, since supplementation with these vitamins lead to a growth reduction. Taurine supplementation did not have any effect in meagre larvae performance. The nutritional requirements and optimum levels of HUFA for meagre fingerlings were examined, evaluating its effects on survival, growth performance, feed utilisation and fish composition. Meagre showed the ability to selectively conserve key fatty acids (FA), particularly Docosahexaenoic acid (DHA; 22:6n-3) and Arachidonic acid (ARA; 20:4n-6) over other FA, in response to essential FA-deficiency. Furthermore, meagre seems to have active Δ6 desaturases and Elovl5 elongase, but their activities were insufficient to produce DHA and Eicosapentaenoic acid (EPA; 20:5n-3) from PUFA precursors to sustain fast growth. The EFA deficient meagre in the present study also showed a higher incidence of granulomas than fish fed two percent n-3 HUFA. Based on our results, DIVERSIFY showed that the requirement for HUFA for meagre fingerlings is at least 2two percent Dry Matter (DM) in diets containing 16.5 percent DM lipids, a ratio of 0.9 EPA/DHA and 0.4 percent ARA of total FA content. The main task for meagre larval research in DIVERSIFY was to provide the industry with an early weaning protocol for this species, that included co-feeding live prey with artificial micro diets. The standard method for meagre larval production is to start weaning the larvae around 20 dph (days post hatching). In the trials carried out in DIVERSIFY we showed that weaning time can be advanced successfully to 15 and 12 dph using a commercial micro diet with a gradual transfer from live prey to the artificial diet over a minimum period of five days. However, larval survival was low due to cannibalism, a major problem in the culture of many marine fish larvae. Size variation is the primary cause of cannibalism in larval fish, together with factors such as food availability, larval density, feeding frequency, light intensity, water turbidity and shelter. This project demonstrated that meagre larvae have the same capacity to digest live prey and microdiets and they can be weaned earlier reducing the production costs if some measures to reduce cannibalism are in place. These measures include increasing feeding frequency, removing dominant individuals and keeping the larvae in the dark when the food was unavailable or in short supply. described and was observed at all stages including early juvenile stages when cannibalism was a problem. There was no compensatory growth of slow-growing fish and it was recommended that slow growing fish were not selected for grow out as an economic analysis indicated that these fish would need six months more to attain 500 g. Genetic differences were observed between fish that grow at different growth rates and genetic markers were identified that were associated to growth. A wide range of husbandry parameters did not alter the variable growth rates and consequently did not alter the wide size distribution obtained. These included light conditions (shaded or unshaded cages), depth (eight- or six-metre cages), feeding methods (self-feeding, hand feeding or automatic feeding), time of feeding (night or day) and depth of feeding (surface or bottom of the cage). In addition, the studies indicated many aspects that can improve feeding methodologies: mortality and feed conversion ratio (FCR) were lower in deeper cages (eight metres). High light intensity from natural sunlight had negative effects on feeding behaviour. The structure of the visual system indicated that meagre are a nocturnal species that prefers low light intensity environments. A total of 50 percent of the stomach content had been transferred to the rest of the digestive channel eight hours after feeding. Self-feeding fish feed during the entire 24-hour period throughout the year. Feeding behaviour was stimulated by both visual (light) and mechanical (aeration) cues. In conclusion, variable growth rates appeared to be related only to genetic differences, which suggested that genetic breeding programs and domestication might be the solution to this problem. The information obtained, indicated that an optimal feeding methodology should adjust to the biological characteristics of meagre by feeding when light intensity is low (dusk, dawn and night), using stimuli to ensure a good feeding response from fish that often cannot be observed and fish should be left to digest during periods of high light intensity (daytime â&#x20AC;&#x201C; particularly mid-day). conferred protection in vaccinates when challenged with V. anguillarum. These data, and related published work from this project, show the potential to modulate immune responses in meagre in culture, such as by delivery of immuno-stimulants, to enhance particular immune pathways at a time of disease risk such as prior to transport. characteristics of the raw material, the technical properties of the products and the process and the availability of similar products in the market. Meagre was used for the development of the “frozen fish fillets with different recipes”, “fish burgers shaped as fish” and “ready to eat meal: salad with fish”. The necessary information to obtain these new products, as well as a number of guidelines, processing conditions, technical specifications and troubleshooting were also described. In addition, basic information regarding the packaging of the food products, conservation conditions, preliminary product shelf life and consumer handling/cooking specifications were provided as well. The technical feasibility suggested that it was possible to produce these products at an industrial scale, which was corroborated by the presence of other similar products in the market. The technical quality of the developed products was also assessed. The total proximate composition of the products (protein, lipid, moisture, inorganic and carbohydrates content), the energy contents of the selected products, the quantitative nutritional value in aspects of fatty acids and the sensory profile of each of them was determined. As expected, processing had an effect on both the proximate composition and fatty quality of the products when compared to the raw fillet tissue. However, the effect depended on the processing method used as well as the inclusion of additional materials (such as olive oil) during the product formulation. Processing generally had a negative effect on nutritional quality reducing the proportion of essential fatty acids, i.e. EPA and DHA, of the majority of products when compared to the corresponding fish fillets. Regarding sensory properties, all processed products exhibited unique sensory profiles. The processed products showed a more complex sensory profile, with more attributes than the unprocessed cooked fillet of the species. The developed characteristics of the processed products in their majority were connected to the added materials and/or the processing method. Finally, the correlation between the fish dietary history (e.g. dietary fat and protein levels, fat sources, etc.) or other rearing parameters (e.g. rearing system, temperature, or density) and the end-product quality was evaluated. Results indicated that filleting yields and protein contents did not seem to be influenced significantly by rearing and dietary histories at grow-out stage. Meagre filleting yield and protein content were quite attractive. EXPERT TOPIC Its total fat contents did not seem to be highly influenced by the dietary or growing history, displaying low contents of fat, which is an attractive feature for low fat dietary regimes. Animals need to eat well to grow. But they will not eat what they do not like, no matter how much you try. That is why Phileo created ProsafÂŽ, a highly palatable source of bioactive peptides, free amino acids and nucleotides to boost growth, performance and resistance, especially in young animals, and better value plant-based diets. Save your explanations and give them a balanced diet they will really love. Aquaculture UK- Aquaculture Awards On May 29th at Dynamic Earth, Edinburgh, UK, the Aquaculture Awards will be taking place, as organised and hosted by Aquatic UK. These innovative awards recognise those who have given exceptional contributions to the industry and cover a variety of topics, such as those who farm with increased and exceptional environmental awareness, as well as the best in aquaculture husbandry and high-quality products being delivered to national and international markets. Categories are sponsored by various aquaculture innovators such as Mowi, BioMar, Cargill and the Scottish Aquaculture Innovation Centre. Tickets to attend the awards give registrants entry into the awards dinner, presentations, three course meal and the entertainment. Tickets cost UK £70 each and the event begins at 19:00PM. Previous winners of the 2018 awards include Moules Frites of the Scottish Shellfish Marketing Group Ltd, for Aquaculture Seafood Product of the Year, as well as Sara Last of Scottish Sea Farms for best Fin Fish Farm Manager and Enviro Nets, for their circular pens as the Most Innovative Product. Asian Pacific Aquaculture 2019 Taking place at the Chennai Trade Centre in Chennai, India, Asia Pacific Aquaculture will be the crucial aquaculture event to attend in 2019. The event is organised by the World Aquaculture Society – Asian Pacific Chapter (WAS) and has a variety of associated institutes, including the Asian Fisheries Society (AFS), National Fisheries Development Board (NFDB), Marine Product Export Development Authority (MPEDA) and many more. Several workshop and conference sessions will be running during the event, which will cover all aspects of the aquaculture sector, including catfish, pre and probiotics, shrimp culture, rid land aquaculture, epidemiology and much more. Registration grants attendees access to all sessions, seminars and the trade show. n March 13-15th in Bangkok, Thailand, the Bangkok International Trade and Exhibition Centre (BITEC) played host to VIV Asia, the 2019 rendition of the biannual exhibition and trade show that brings members of the food and feed industry in their masses from all over the world. The exhibition was a glorious affair, with hall after hall brimming with companies that specialised in every aspect of the food and feed production industry for aquaculture, poultry, livestock, swine and more. Over 45,000 visitors were confirmed over the three-day span of the event, and dozens of conferences were also held for industry members to attend. VIV reported a seven percent increase in visits from those outside of Bangkok this year, proving that the event is only becoming more and more international and gaining more of a reputation as one of the best-serving events for the sector. Overseas visitors came from over 120 countries, the top ten visiting markets being reported as China, India, the Philippines, Vietnam, Indonesia, Malaysia, Bangladesh, the Republic of Korea, Taiwan and Pakistan. Compared to the 2017 rendition of the event, a remarkable 1,245 exhibitors were confirmed (an 18% increase) and they covered an extra 30 percent of the floorspace at BITEC. In my time exploring VIV Asia I discovered a variety of innovations for the aquaculture industry that will no doubt become integral for the future of fish production. VIV Asia was, also, not just about the exhibition: there were plenty of conferences to be had- two of which were organised by International Aquafeed magazine! More information about one of our conferences, the Aqua Feed Extrusion Conference, can be found in this issue, and a report about our second conference, the Aquatic Asia Conference, will be available in our next issue! The next VIV event for aquaculture will take place once more in Bangkok, January 15-16th and will be entitled VIV Health and Nutrition Asia 2020. Matador Chinese machinery company Matador were also showcasing their latest pellet mill, the M-Type, at VIV Asia. Seven varieties of the M-Type Pellet Mill are available from Matador, each one different to suit the userâ&#x20AC;&#x2122;s ideal needs and requirements. Capacities are available up to 40 tonnes-per-hour, and pellet production can be easily customised, for pellets to be created between the sizes of 1.8-12mm. Each part is easily interchangeable for upgrading, so users never need to fully swap out their machine for a new one at massive expense, and each part is made of corrosion-resistant and rust-resistant material. The inner die ca come in sizes between 350-762mm. Jefo Jefo were present at the exhibition and were promoting their various products for the aquaculture industry, such as Profeed, Eazyaqua and AG 175 which boasts improved gut health for fish, crustaceans and all forms of aquatic species. Their unique forms of enzymes contain a natural heat stability to resist manufacturing conditions, as well as providing realistic cost savings. Sahapaphop Sahapahpop are a local business based in Thailand, founded in 2013, that specialise in the spare parts users may need for their food machinery systems, such as oxygen sensors, thermocouples, air filters, sealing rings, engines, gas engine management systems, spark plugs and much more. Bühler Bühler’s stand advertised a great variety of their solutions for aquafeed, such as the PolyTherm Preconditioner- a variety of preconditioner that Bühler have available in six sizes, ranging from 100-1,600 litres capacity. Another solution offered was the PolyTwin, a twin-shaft extruder that can be created and adjusted according to the user’s specifications. The twin-shaft technology ensures that users get the best quality extruded feeds available for a smart price. The company also had their AHHC/AHHD Pellet Mill out for show on their booth, which gathered a great deal of attention for its various advantages and innovative features. The AHHC/AHHD Pellet Mill from Bühler is able to handle conditioning temperatures over 95°C, to ensure the eradication of any harmful pathogens and microorganisms, as well we also enhancing the pellet quality. The large clean-out door also ensures clean out is quick and easy, and reduced residue has been implemented through a novel design of the mixing tools. The inlet of the pellet mill has heating pads, and minimal space is needed for the machine, thanks to Bühler’s advanced pellet mill design. The user can also select their ideal die speeds, due to the refined power transmission engineering. Optional functions can also be added to the machine, such as automatic lubrication, roll gap adjustment, a hotsil pad and fullyautomatic control. Enhalor Founded in 2000 and based in Beijing, China, Enhalor focus on the intricacies of animal nutrition and develop premixes and yeast cultures for animals. Their Aquatic Animal Nutrition laboratory contains renowned experts in aquatic nutrition who produce feed premixes for the aquaculture industry. They had some of their premixes and solutions on show in largerthan-life scientific test tubes and their emphasis was clearly on the scientific, as their staff were eager to explain the intriguing science behind their products and what makes their solutions so unique for the industry. ALIPHOS, EUROPE’S LARGEST PRODUCER OF FEED PHOSPHATES, ALSO OFFERS WINDMILL® AQUAPHOS FOR USE IN AQUACULTURE. YOUR BENEFITS • Windmill® Aquaphos has been specially developed for use in modern, highly concentrated aqua feeds. • Tests with both cold and warm-water fish but also shrimp prove that the phosphorus digestibility and retention of Windmill® Aquaphos is superior to other phosphates used in aqua feeds. • Use of Windmill® Aquaphos reduces the loss of phosphorus in the environment. Zheng Chang Zheng Chang’s stand was dominated by their incredible MZLH range pellet mill, which can effectively use by-product wood to assist in the production of pelleted feeds. The capacity in the MZLH range has increased by 15 percent, compared with previous models, and also boasts the ability to produce feed pellets between 6-12mm in size with engine outputs of between 90-280kW. Their smallest model, the MZLH 420, has a production rate of up to 1.5 tonnes per hour, whilst their most heavy-duty model, the MZLH 858 can produce up to four tonnes of pelleted goods per hour, an amazing amount to behold. Production has also been increased by a remarkable 15 percent, through higher gear transmission rates for boosted efficiency, a larger transmission torque and larger roller friction. Also on show by Zheng Chang was their SPLG Automatic Microelement Batching Scale, to solve the problem of troublesome weighing, batching and feeding- ensuring each process can easily be integrated into your factory’s working process line. This machine has a stainless-steel self-cleaning U-type scraper, corrosion resistance and preventative measures towards cross contamination and residue to ensure the machinery remains easy to use and free from debris. Atacama Bio Natural Products Biotechnology company Atacama Bio Natural Products cultivates algae to extract healthy ingredients for humans. Based near the Atacama desert, from which it derives its name, their 250-acre facility houses photobioreactors. They call their microalgae product they harvest Red Meal, which contains natural elements from haematococcus pluvialis and serves as a very good source of protein, energy, nucleotides, astaxanthin, minerals and vitamins. Red Meal serves as an antioxidant for fish when utilised as fish oil, and the use of microalgae is proven to increase egg quality and quantity, as well as increase rates of larval survival. Crustaceans and salmons fed this microalga also show a better survival and growth rate, as well as it providing them with optimal nutrition in their diets. While attending their booth, we discovered that Red Meal is the only microalgae which exclusively produces astaxanthin. Whilst astaxanthin can be produced via the chemical fermentation process of GMO yeast or from petrochemical synthesis, these methods contain up tp 75 percent enantiomers (3R, 3’S) what is extremely undesirable due to its unpredictable physiological effects on aquatic life. Atacama Bio natural products is, as the name suggests, completely natural, and their products serve as great examples of the many benefits of going all-natural with your aquatic solutions. The Aqua Feed Extrusion Conference @ VIV Asia The one-day Aqua Feed Extrusion Conference was organised by the International Aquafeed magazine, VIV and Dr Mian N. Riaz, world leader in extrusion technology and head of the extrusion technology program at Texas A&M University. The conference was held during the VIV Asia exhibition in the BITEC conference centre and, I can happily say, proved to be an astounding success. This conference was attended by more than 50 participants from several different countries, including Pakistan, India, Bangladesh, Thailand, Indonesia, Vietnam, and several other countries. Participants were enthusiastic and eager to learn about all the varieties of extrusion technology and feed processing technologies. Participants appreciated learning about the latest knowledge and information about aqua feed extrusion technologies. All the participants received a certificate of completion at the end of the course. by Jonathan Iman, Corporate Project Services Jonathan Iman provided an intriguing talk on the wider aspects of the utilisation of machinery such as extruders- the necessity of proper project planning when building a new factory or expanding your operation. Mr Iman stated that there are five areas to consider when planning a project: feasibility, inputs, design, food safety/sanitation and equipment. A project should be feasible with a good return on investments, as well as a manageable total cost of ownership. Location, permits, air quality and water quality are also important considerations. Design is a complex feature to consider, as this depends on the building layout and easy integration of machinery that all flows smoothly from process to process, whilst ensuring everything remains hygienic. Ingredients must also remain sanitary by remaining separated and proper analyses must be carried out to ensure food is all kept hygienic. Once Mr Roger Gilbert of International Aquafeed completed introductions, Dr Riaz kicked off the conference with the first talk, which gave a very comprehensive and thorough overview of the intricacies of extrusion and how such technology works to process your raw materials. Extrusion technology, he stated, first began being used in 1948, but since that time it has evolved drastically to become a somewhat more common and refined process. He stated the many benefits to extrusion, such as the low-cost of the process as well as its remarkable energy efficiency and high product quality. The difference between single-screw and twin-screw extruders was also discussed (twin-screw extrusion, although more expensive, provides a higher-quality level of quality control and flexibility). Mr Näehrig’s discussion went into some detail regarding the impressive history of the Amandus Kahl company and their various turnkey solutions, as well as the latest innovations in their new extruder line: The Extruder 0EE 25 NG (Next Generation). This new product has a capacity of up to 10 tonnes-per-hour and features state-of-the-art processing tools, to ensure superior performance for sinking and floating aquatic feeds. Amandus Kahl’s latest extruder also works extremely well with their other machinery, and Mr Näehrig described the other great products the company offers, such as their vacuum coaters and belt driers which seamlessly integrate with Amandus Kahl extruders. Mr Engrem discussed micro extrusion solutions for the feed industry and the importance of fully analysing the need to develop precise solutions that comply with all required specifications. The process for proper project management was also discussed, from building a project charter, project execution and the closure and completion of projects. The quality of feeds was also discussed, as well as the various benefits of pre-grinding. Andritz presented an interesting talk on how extrusion can be used to create the ideal form of feed for tiger prawns, white leg shrimp, white shrimp and Indian prawns. Feeds for these aquatic creatures varies greatly, depending on the growth stage of each of these creatures- whether they need larvae, postlarvae, starter, grower, finisher or broodstock feeds. Mr Lastein also discussed the various feed requirements that are needed for shrimp and prawn feed, such as whether the feed sinks or floats, any coating that may cover the feed, spots, uniformity, water stability and particle size distribution. Going through each process carried out in the feed mill process systematically, Mr Lastein presented useful information for the best tips on how to create the optimal feed. Mr Dréan spent his presentation discussing the many benefits behind twin-screw extrusion technology, a process that has refined the extrusion process since its first invention some 40 years ago. He noted that the demand for quality feeds that provide all the necessary nutrients for animals is as essential as ever, as the demand for food sourced from aquaculture is only increasing as our population drastically continues to expand. Mr Dréan estimates than an incredible 30-40 million tonnes of compound feed are required for aquatic animals every year, which does not even take into account livestock, poultry, swine and ruminant feeds. Dr Wilson’s discussion specialised in the use of and complications with heat in the extrusion process, particularly hot spots that occur as the extruder runs. Every step of the extrusion process from grinding, preconditioning, drying and top-coating, to name a few, produces heat which provides alterations to the feed as it is produced. These long heating times also cause feeds to lose vitamins, cartenoids and feed enzymes- this is especially true in the pre-conditioning process, which takes between two-to-four minutes, as well as the dryer process, which can take up to 20 minutes to complete. Dr Riaz concluded the Aqua Feed Extrusion Conference by emphasising the importance of raw materials in aqua feeds. He noted that particle size has significant impact on creating an improved product appearance, as well as ease of cooking and a better retention of liquid coatings. Selecting the best ingredients, he continued, also helps enable your feed to remain perfectly uniform, easy to process, have a pleasing texture, as well as remaining economically viable and palatable. He also explained the importance of protein and starch, both of which are extremely common components of aquatic feeds with a high level of each inside them. After this, he also discussed the importance of lipids, and the best ways in which to add them to your feed. The conference proved especially popular this year with over 50 registrants and a full room of people eager to hear our speakers present their talks. The environment was especially pleasant, as the audience proved their dedication and intrigue with regular questions after each speech, and a willing interest in talking with our speakers after the event and during the lunch and coffee breaks. Following the completion of the presentations, Mr Roger Gilbert of International Aquafeed magazine and Dr Riaz thanked the audience for their attentiveness, and I came onstage to help distribute certificates to all of the attendees of the conference. We are exceedingly well pleased with how this rendition of the Aqua Feed Extrusion Conference went, and we look forward to organising the next one very soon! If anyone has any enquiries about the conference or requires information about the next edition of the Aqua Feed Extrusion Conference, you are welcome to email me at rebeccas@perendale. co.uk. the interview Niels Lundgaard, Commercial Director for Africa, Aller Aqua Niels Lundgaard graduated from Aalborg University with a Graduate Degree/HD in Marketing Management. For more than four years he has worked in Aller Aqua, originally serving as their International Relationship Manager, before progressing onto being the Commercial Director for Aller Aqua Africa. My role as Commercial Director for Africa at Aller Aqua has many aspects, and my days are therefore very different. My tasks span from development and implementation of overall commercial strategies, through establishing and developing our market cultivation, and to the important aspect of staying in continuous contact with local farmers, partners and employees. We focus on our slogan “Let’s grow together”, which basically means that we help ensure that the individual fish farmer can achieve the best possible output, and thereby profitability. We work consistently hard at providing the best conditions for our customers to achieve this. We want to be more than a supplier; we want to be a trusted partner. Having a diverse job means that I am constantly challenged, and my markets are very interesting. My African colleagues are highly skilled and motivated, and we have found a good connection and way of cooperating, despite the physical distances. At the same time, I do travel to Africa a great deal to ensure closeness to the market. At Aller Aqua we seek to create a positive difference in the markets we operate in. Working in a sector with the potential we see in aquaculture, and a company with this many capable and dedicated employees, as well as customers who are passionate about creating a profitable and sustainable business, it is impossible not to feel positive about this business. Aquaculture has the possibility of having a huge impact on many of the UN’s 17 Sustainable Development Goals. Goal 2: Zero Hunger, Goal 8: Decent work and economic growth, Goal 13: Climate Action and Goal 14: Life below water are all obvious, and very applicable to Aller Aqua. However, the aquaculture sector has the potential of a wider reach. I find it motivating to see our customers’ businesses prosper, whilst we can supply them with feed which deliver a better result and a minimal environmental impact compared to traditional feeds. Aquaculture is seen as the solution to delivering food to the growing world population, and I am proud to be a part of the solution to this complex problem. African aquaculture is constantly growing and, thus, the need for product optimisation is increased throughout the value chain. Addressing the main challenges in the individual markets is fundamental in the company’s strategy and business structure in Africa. Through dedicated effort from our colleagues in Africa, Germany and Denmark we ensure reliable availability. Our R&D department helps achieve the optimum feed conversion ratio, whilst Quality Assurance ensures a high and consistent quality. Locally, we arrange training and seminars in order to ensure that fish farmers have the right tools to help their business grow. for a charity called Bylling Foundation. It feels motivating that my daily work makes a difference on many levels. There are a few that are important. Transparency in the value chain needs to be improved. A few initiatives are tackling this in different ways, but it needs to be more widespread. The public opinion needs to be considered. An increased understanding of the benefits of aquaculture would be beneficial to everyone. Furthermore, the sectors dependency on marine resources must be lowered – both in terms of potential overfishing, and in terms of the cost of the feeds. A great deal of research is going into this, but so far, fish meal-free diets cannot effectively match the output of feeds for carnivorous fish with fishmeal. Africa is a big continent, and the various countries and regions each have their own challenges and positive sides. Aquaculture in Africa is high on the agenda for many politicians and has been deemed of very high importance to help feed the growing population on the continent. Practically, it is harder to find support for aquaculture and bureaucracy can be limiting. We have become founding gold sponsors of the African Chapter of World Aquaculture Society. Their finest task is to promote the growth of aquaculture in Africa. It is important for us to continue to have a positive impact on aquaculture globally. Aquaculture is experiencing significant growth, and it is vital to support initiatives which help ensure that growth of aquaculture is facilitated all over Africa. This is done through research, as well as sharing knowledge. Besides our own activities, we can help achieve this through our support of the WAS African Chapter and their efforts. I am pleased that WAS has chosen to focus on aquaculture in Africa and, through the African Chapter, recognise the large diversity on the continent. We experience it when meeting with customers from the various African countries Another challenge for African aquaculture is the fast growth coupled with traditional feeding methods, which creates pollution. Part of the solution is education, to show how using professional extruded feed increases the yield and improves other important parameters such as growth and water quality. One of our initiatives in Africa is our seminars, which are attended by many fish farmers each year. Last year, in Nigeria alone, we had more than 2,000 participants. The idea of the seminars is to provide tools and information to give the farmers better prerequisites for growing their businesses. We are positively surprised by the large extent of interest we see in upcoming seminars. hristian Martin is Global Business Development Director at Veramaris. Prior to his current position, he was Global Category Manager, Aquaculture and Global Key Account Manager at DSM Nutritional Products within the Animal Nutritional & Health team and a Joint Management Team lead within the DSM – Evonik algal omega-3 joint development effort. ecently resigned head of Cargill Aqua Nutrition, Einar Wathne, is now due to join the board of Bakkafrost, Faroese salmon producers. Mr Wathne has 32 years’ experience in the aquaculture industry and Bakkafrost have expressed their utmost pleasure to now have Mr Wathne join their team. Mr Wathne recently left Cargill on February 1st but expressed his desire to continue his work in the aquaculture industry. KVA group’s current SVP Technology and Development, Trond Severinsen, is planning to resign after more than 25 years with the company. In his place will be Espen Fredrik Staubo. Espen Fredrik Staubo has a PhD in Nuclear Physics and extensive management experience from a number of international businesses, including McKinsey, Elkem and Elopak. Between 1997 and 2005 he worked for Stolt Sea Farm, including four years as President for the company’s European business. “AKVA group has been a pioneer and technology driver in the aquaculture industry for more than 45 years. Our ability to offer innovative solutions that break the ground for new opportunities in the industry, streamline daily work operations and promote good fish welfare, is fundamental for us in order to succeed. Mr Staubo will play an important role going forward and we are excited to welcome him to the team” says CEO Hallvard Muri. an is passionate about sustainable aquaculture and has substantial experience in aquafeed innovation, marketing and sustainable development from earlier roles with EWOS, Cermaq, and Cargill. Ian holds an MBA from the University of Strathclyde in Glasgow, Scotland and also pursued studies in aquaculture. he New Group Operations Manager for Young’s Seafood has been announced as Mr Mark Richmond, due to replace Steve Lidgett who is now retiring. Mr Richmond will be tasked with overseeing all the company’s manufacturing operations, and his appointment will begin next month. The Permeabilizing ComplexTM blend in BiotronicÂŽ Top3 weakens the outer membrane of Gram-negative bacteria, thus boosting the synergistic effect of its components, the organic acids and the phytochemical.